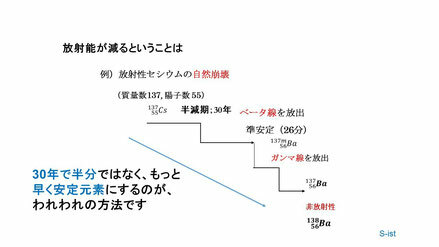 the spin of Infoton < H+ ～ e - > and energy Hν in water that is named SIGN water(Spin Information Gauge Network) by Sugihara. Electric Power ----individual power generation! Old style energy(electric power) is a large plant and needs a power transmission line. However, an individual system has been developed just like mobile phone. Namely, solar, fuel cell and thermoelectric power system should be in progress without transmission line and everybody can generate electric power at home and can have a battery system,too. Within a few years, we should develop more efficient materials to which can be done by way of shifting the eneryg policy and strategy. Taking into consideration of nuclear power reactor, they should decommision or demolish for which we need high technology. I have studied and succeeded faster method for reduction of radioactivity from radioactive caesium.